MORE unreleased Real Kids from 1976-1977! More unissued stuff, way more pix and stories of Boston's finest Rock & Roll band. 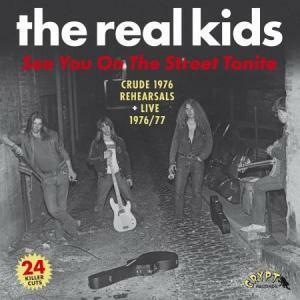 Twenty-four previously unreleased Real Kids cuts—kicks off with ten crude rehearsals from April/May 1976, of which six were never re-recorded in a studio setting, plus fourteen live cuts from 1976-1977 chosen as best from a stack of 31 cuts. 21 originals and 3 cover songs all housed in a double gatefold LP, plus innersleeve crammed with photos, zine clippings and liner notes. CD version includes a 20-page booklet. 19. Rosalita (live, Cantone’s, May 7 ‘77) 2:20 - Alpo on lead vocal!